The Hawkeyes were clicking on all cylinders against Nebraska, scoring 49 unanswered points and cruising to a 56-14 victory at Memorial Stadium in Lincoln. Things got off to a shaky start. Parker Hesse’s fumble recovery touchdown was overturned, Punter Colten Rastetter fumbled a snap recovered by the Cornhuskers, and Nebraska capitalized to take an early 7-0 lead after a one-handed grab by WR Stanley Morgan. When Ihmir Smith-Marsette stepped out of bounds at the one yard line on the ensuing kickoff, it looked like Iowa was destined for a third straight discombobulated loss. But then Hawkeyes unleashed a 15-play, 99-yard touchdown drive to knot the game at seven. After Quarterback Nate Stanley snuck his way to a fourth and inches conversion, Akrum Wadley broke free for a 20-yard touchdown scamper. It was the first of many for the Hawkeyes. The tide turned in Iowa’s favor after Nebraska elected to fake a field goal from Iowa’s 24 yard line. The pendulum swung back into Nebraska’s favor when Morgan collected his second receiving touchdown of the game. The Husker broke free on a corner route with 6:18 remaining in the first half to make the score 14-7. It marked the last time the Huskers would reach pay dirt. From then on, it was all Iowa. After Iowa’s drive stalled out, Nebraska roughed Rastetter on his rugby attempt to give the Hawkeyes a fresh set of downs. Iowa took advantage with an 11-play, 75-yard march that culminated in a four yard TE Noah Fant touchdown just before the halftime break. Iowa completely annihilated Nebraska in the second half, starting from the kickoff. Smith-Marsette made up for his earlier blunder by returning the second half opener for a touchdown. However that play was called back because of an illegal block in the back by Geno Stone, but Iowa still started the drive at Nebraska’s 22 yard line. Five plays later, Wadley strolled into the endzone for his second score, making the count 21-14 Iowa. The Hawkeye defense held serve the following possession, and the offense came through with a two-play drive. Nate Stanley connected with Fant on a 44-yard bomb before James Butler scored his first touchdown as a Hawkeye on a 12-yard rumble. Just like that, Iowa had doubled up Nebraska 28-14. Iowa was far from finished. Tanner Lee just couldn’t resist throwing an interception, and Ben Niemann obliged. The turnover led to Wadley’s third touchdown of the game, taking his career tally to 34, good for third in Iowa history. On the touchdown run, Wadley also went over 1,000 yards for the second consecutive season, becoming just the fourth Hawkeye to ever accomplish that feat and move into fifth place rushing all time in Iowa History. Wadley finished with 19 carries for 159 yards and three touchdowns. He’s the third player in the last 20 years to rush for at least 150 yards and score three rushing touchdowns as a visitor in Memorial Stadium. Nebraska native Fant scored his second touchdown of the evening on a 68-yard catch and run, making the score 42-14 and bringing the unanswered tally to 35. LB Josey Jewell, who finished with eight tackles, one for loss, and three passes broken up, intercepted Tanner Lee after Anthony Nelson disrupted Lee’s arm motion. RB Toren Young cashed in moments later to bring the score to 49-14 Iowa. Young’s fellow backup running back Ivory Kelly-Martin got in on the fun, too. The freshman broke a 57-yard run to bring Iowa inside Nebraska’s 10 yard line before pounding in the final touchdown of the game. Kelly-Martin finished with 90 yards and a touchdown on six carries. Fant became the first Hawkeye to eclipse 100 receiving yards in a game with his three catch, 116-yard, two touchdown performance. The Hawkeye offense totaled 505 yards (192 passing, 313 rushing) in a performance similar to the one put on against Ohio State. The defense had three interceptions, moving into sole possession of most team picks in the NCAA (19). 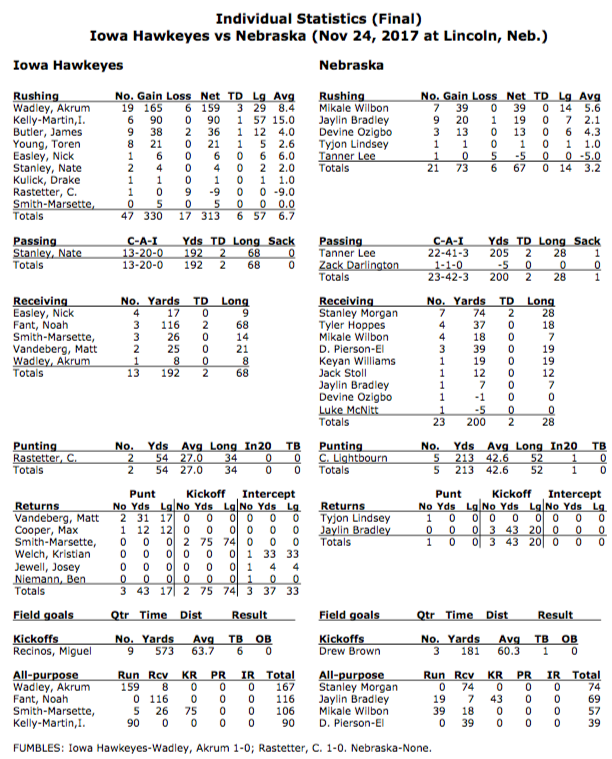 Iowa’s Offensive Line played its best and most complete game since the dominant win over Ohio State. Nate Stanley was sacked six times last week by Purdue – but not sacked once in this game by Nebraska. 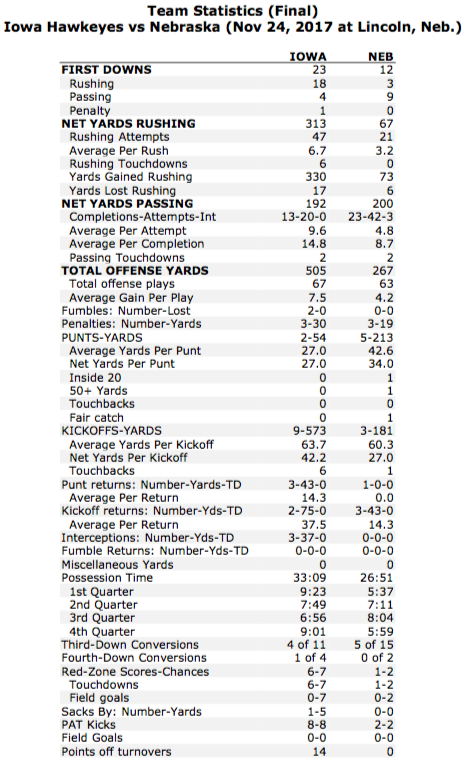 Nebraska’s Defense has been woeful this season, surrendering an average of 237 yards per game rushing against Big Ten opponents this season – the Hawkeyes blew past that mark by 76 yards. Iowa is now 27-1 since the start of the 2015 Season when rushing for 100 yards or more (compared to 0-11 when not doing so). It was a virtuoso performance by the Iowa Hawkeyes, and one that likely sealed the fate of Head Husker Mike Riley. Riley made the same mistake Iowa Head Coach Kirk Ferentz made last week vs. Purdue: starting the second half by electing to wait to take the wind until the fourth quarter. It cost Iowa the win last week – and Nebraska the win in this game as the Hawkeyes put 28 third quarter points on the board to put the Huskers in a hole whey couldn’t climb out of. The Hawkeyes finish the season still holding three of their four rivalry trophies (all but the Heartland). It was Iowa has retained the Heroes Trophy three straight times, defeated Nebraska three of the last four games and three straight times in Lincoln, and blown out the Cornhusker in back to back games. Iowa finishes the season 7-5, 4-5 while Nebraska drops to 4-8, 3-6. The Hawkeyes will go bowling somewhere – Nebraska will likely go on a search for a new head coach. Iowa (7-5, 4-5) defeated Nebraska (4-8, 3-6), 56-14, Saturday at Memorial Stadium. DB Josh Jackson finished the regular season with seven interceptions and 25 passes defended. He finished tied for fourth all-time with seven interceptions. Desmond King (2015), Lou King (1981), and Nile Kinnick (1939). QB Nate Stanley’s two touchdown passes against Nebraska ties him for third all-time in single-season passing touchdowns with James Vendenberg and Ricky Stanzi. He trails only Brad Banks (26) and Chuck Long (27) in program history. LB Josey Jewell had 8 tackles today, snapping his 21 game streak with double-digit tackles. Jewell has 426 career tackles, for fifth all-time in program history behind Brad Quast (435), Abdul Hodge (453), Andre Jackson (465), and Larry Station (492). Jewell intercepted his second pass of the season and sixth of his career in the fourth quarter. Senior WR Matt VandeBerg has a reception in 31 consecutive games played. VandeBerg has 133 career receptions, 10th most in program history. He has 1,677 career receiving yards, 16th in program history. RB Akrum Wadley is one of 15 players in program history to rush for 2,000 career yards. He has 514 career carries for 2,784 rushing yards, fourth all-time, passing Fred Russell. Wadley has 27 career rushing touchdowns, fourth all-time, 34 career touchdowns, third all-time, and 204 career points, 10th all-time. Wadley has 3,621 career all-purpose yards, ninth most in program history (2,784 rush, 737 receiving, 100 KO returns). Wadley reached 1,000 rushing yards in the third quarter against Nebraska. He is the fourth Hawkeye to post back-to-back 1,000-yard seasons. He is the first since Fred Russell did it in 2002 (1,355) and 2003 (1,264). Wadley is only the third opposing player in the last 20 years with 150+ rush yards and 3+ rush TD in Nebraska’s Memorial Stadium. Second-year tight ends Noah Fant (So.) and T.J. Hockenson (redshirt freshman) have combined for 51 receptions this season. Among those 51 receptions, all but seven have resulted in a touchdown (13) or first down (31). Fant has 28 receptions, including a team-high 10 touchdowns. The 10 touchdowns are a single-season record for an Iowa tight end. He has 15 more catches that resulted in a first down. Fant’s 10 touchdowns are the most by a Hawkeye since Marvin McNutt caught 12 touchdown passes in 2012. Ihmir Smith-Marsette opened the second half on 74-yard kickoff return, longest of the season. RB James Butler scored his first touchdown of the season on a 12-yard rush in the third quarter. Freshman Geno Stone recorded a career-high eight tackles in place of senior Miles Taylor, who was injured in the first half. Freshman Matt Hankins started his first career game at corner. Iowa’s 56 points are the most scored by Iowa in the series history and the 42-point margin is the largest margin of victory by Iowa in the series history. Iowa’s 56 points are the most scored in a game this season and most since the team posted 62 in a win over North Texas on 9/26/15. Iowa scores 50+ points in multiple Big Ten games in the same season for the first time since 1990. Head coach Kirk Ferentz recorded his 142nd win at Iowa, becoming one win shy of tying Hayden Fry as the Hawkeyes’ all-time winningest football coach. Iowa finished the season winning three of four trophy games. Iowa has won the last three Heroes Trophy games and is 10-2 since the start of the 2015 season in trophy games. Iowa took the lead in the Heroes Trophy series at 4-3. Iowa scored on four straight drives for the first time this season. Iowa’s 99-yard scoring drive in the second quarter was the longest drive of the year for the Hawkeyes and second longest drive in terms of plays and time possession. The last Iowa drive to to go 99 yards was against Rutgers on 9/24/16. 69 degrees at the time of kickoff was the warmest temperature for an Iowa regular season finale played outdoors since 1981, when Iowa hosted Michigan State in Kinnick Stadium. The temperature in that game was officially listed in the mid-60s. Iowa won the toss and elected to defer. The Hawkeyes have played 239 games under head coach Kirk Ferentz. Iowa has opened the game on offense 182 times (110-73). The Hawkeyes have opened the game on defense 57 times (32-25). The Hawkeyes will learn their Bowl destination Sunday, Dec. 3. 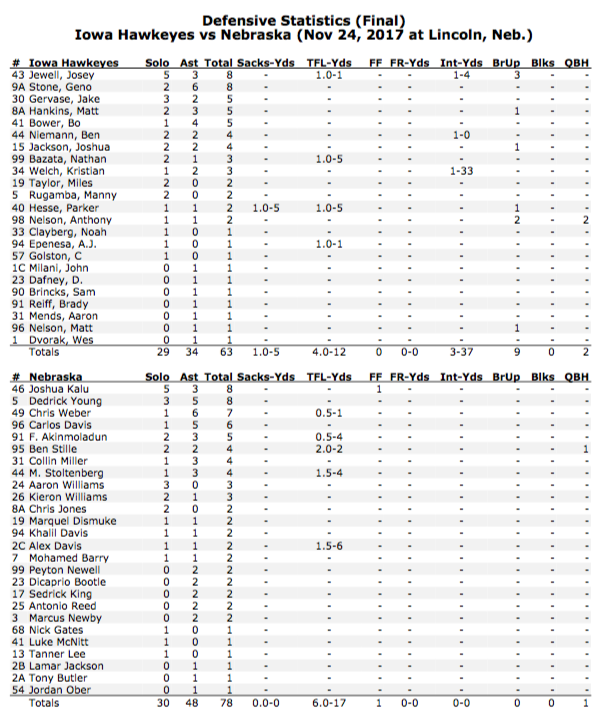 Iowa-Nebraska Post-Game Notes, Stats, Play-By-Play, and Season Stats are here.